"A Puerto Rican side, usually served with rice and beans in our family." Heat the oil in a heavy skillet over medium heat. 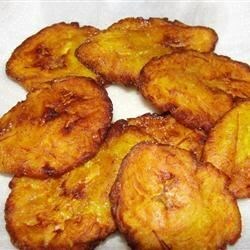 Place a few plantain slices in the oil, and cook until lightly golden in color, about three minutes. Drain on paper towels. Repeat with the remaining slices. While the plantain slices are still warm, place them one at a time between two sheets of wax paper, and flatten by hand to 1/4 inch thick. Return flattened slices to the skillet, and continue frying until golden brown. Drain on paper towels, and season with salt and garlic powder. Watch how to make crispy fried plantains! Just remember... for tostones plantains need to be very green. these taste just like the ones I had at cuban restaurant. I served these with the mojo marinade for "grilled mojo chicken with asparagus" on this site. The mojo makes a great dipping sauce.